OJN saw a lot of progress this week. I've been working day after day laying the framework of the site. Now that it is Friday, it is time to kick back and relax. What better way to do this than with a night on Netflix? You should already see a bit of a problem here since aside from the few gems that you find on there, most of the shows and movies on Netflix are kind of lacking in terms of quality. But, I think that is just my personal gripe with them. I was actually about to watch Mighty Morphin Power Rangers as my last resort, until I noticed something that reminded me of Super Sentai. Thus my excursion with Karate-Robo Zaborgar began. This movie has 4 out of 5 stars so it couldn't be that bad, right? Maybe. I'm not going to lie. I walked into this expecting some weird Super Sentai/Kamen Rider ripoff. I guess I was sort of on the mark. In the first 5 minutes, I was welcomed to the movie by a floating head and robot Samurai attacking Japanese politicians. For the love of mike....the samurai was stealing their DNA by stolen kisses. The only thing that I could think at this point was "What the hell am I watching and why?" Needless to say, I decided to give this movie a chance to live up to its 4 stars. This movie follows the battles of the main character, Daimon, and his robotic motorcycle, Zaborgar, against an evil organization named Sigma. This movie is a bit weird, but it does seem to pick up a bit mid way through the first chapter. I have to admit, it is pretty cheesy with some things being downright predictable. For example, missiles shooting out of Ms. Borg's breasts. Oh Japan, why do you make such weird and perverted things to put in your movies? The fight scenes in this movie were a bit cheesy too. Daimon's combos usually end with a sort of Bruce Lee sound effect. 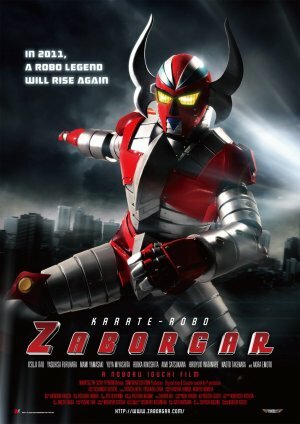 In watching this, I wasn't sure if this was a Tokusatsu spoof or not. The fighting was full of special moves being called out. Zaborgar took orders during the fight like he was some sort of pokemon. Despite that, I still found it to be entertaining. This was definitely a movie that didn't take itself too seriously, and I for one can appreciate that.